Teaching English in Thailand is a great way to gain valuable experience and hone teaching skills while enjoying beautiful beaches, bustling markets and amazing cuisine. Thailand's school year generally begins in May and ends in March, with a three-week semester break in mid-October. Hiring for most schools is done in February and March in preparation for the first semester starting in May. July-August is the next hiring push for universities and the October term. Deciphering the difference between public and private schools is often under debate. The biggest differences tend to be class sizes, cost and accessibility. It is argued that private schools offer a better education and secure better quality teachers. However, many maintain that, as the government's contribution to the Ministry of Education is very significant and focuses on teacher training, teachers in the public school system have a greater opportunity to receive ongoing training and funds are available to do so. The private sector does tend to have a lower student-teacher ratio however, which is a definite advantage. Both systems have their strengths and weaknesses, and ESL teachers would need to determine in which environment they would be most effective. Universities and colleges in Thailand fall under the jurisdiction of the Ministry of University Affairs in both public and private sectors. With greater government focus on education in recent years, Thai universities have begun to climb in ranking, and in 2006, three universities were designated as "excellent" in Academics and Research by the Commission on Higher Education. ESL teachers desiring to teach in a Thai university will most often find that a BA (Masters preferred), TESOL certificate and teaching experience are required. Graduates of Oxford Seminars receive our Job Placement Service with exclusive access to established schools and recruiters around the world, including Thailand. - ECC (Thailand) - is one of the largest private language and computer schools in Thailand with more than 50 branches throughout the country. Students at ECC cover all ages and ability levels, and have access to a wide variety of courses including general conversation and specialized test preparation. - Inlingua - has branches worldwide and only uses native English instructors to teach their English classes. They offer many types of courses and languages at all levels through small classes or private tuition. 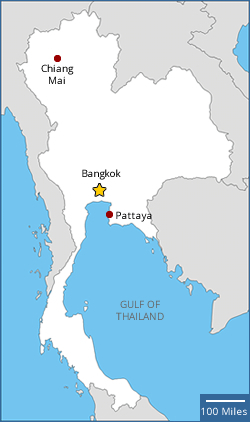 Currently there are language centers in seven of Bangkok's most populated areas. - A smile goes a long way in the "Land of Smiles"! 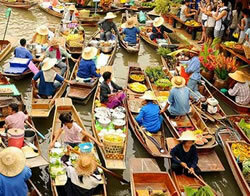 - Things move at a slower pace in Thailand than they do in the West. Learning to be patient and avoid being in a hurry will lessen stress. - The Thai are a gracious, non-confrontational people. Any conflict should be handled in a calm, private manner avoiding accusations or assigning blame so as to "save face". - Foreigners should always carry official identification. - Always carry tissue and hand sanitizer because public washrooms rarely provide toilet paper or soap. - Keep in mind that wearing gold or yellow may suggest that you support the king and that wearing a red shirt may suggest strong political ties (anti-government). - As you will have to leave your footwear at the door of restaurants, choose an inexpensive pair so that good ones don't get taken. - Because of the high humidity during hot season, clothing may take up to 24 hours to dry. - 'Farang' is the term for foreigners. - When purchasing a calling card, check to make sure that pay phones in the area are able to make international calls. - Clothing and shoes for Western sizes are not always in abundance. Taking footwear may be prudent. Having clothing made to fit at a very reasonable price is a great option once in Thailand. 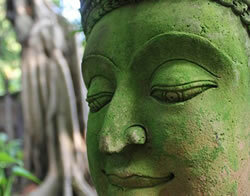 Historically, finding a teaching position in Thailand was relatively easy. In recent years, however, the government has focused its attention on this sector, dedicating a large financial portion to teacher training and creating a new trend of higher requirements for teachers of English from outside of Thailand. Generally speaking, a College Diploma or a Bachelor's Degree with the Oxford Seminars TESOL/TESL/TEFL certificate is required; however, there are some exceptions to this rule. Finding jobs without a degree is most easily done in person or with location flexibility. The requirements and guidelines below are listed for ESL teacher applicants to Thailand who are citizens of United States, Canada, Britain, Ireland, Australia, New Zealand, or South Africa. Citizens of other countries may be required to produce additional documentation. It is important to consult the consular services of the Thai embassy/consulate to confirm details of each application. - Working Holiday Visa (WHV) - for citizens of Australia/New Zealand ages 18-30. The purpose of the WHV is for touring and allows those using it to work in-country in order to cover the expenses of travel. As such, this visa may not be suitable for teaching English.